Space for Grace: Stories from the Catholic Chaplaincy (published by Shanway Press, priced £15) is the first book from Queen's BA Film Studies graduate (2009), Dominic O'Reilly from Newcastle, Co. Down. It is a collection of stories from the chaplains, alumni, staff and visitors to the Catholic Chaplaincy at Queen's since the 1950s, right up to the present day. “As someone who has served in the Chaplaincy as a student and later in life, I took the decision to put together a compendium of memories after hearing other people's stories of University life,” said Dominic. “The Chaplaincy is a physical place but it also creates space for grace within each of us. It exists within the diocese of Down and Connor but is open to one and all – a truly welcoming home away from home. But above all it is a space in which we can encounter God's grace, freely offered at any time. "Space for Grace are words I associate with Bishop McKeown and I think they really sum up the Catholic Chaplaincy at Queen’s,” added Dominic. The book includes personal accounts from individuals who have contributed to the shaping of the political arena of Northern Ireland – people such as Margaret Ritchie MP, Professor Monica McWilliams, Eamonn McCann MLA and Austin Currie. It contains stories of clergy who experienced life on the University campus such as Bishop Donal McKeown and Bishop Anthony Farquhar, and contributions from former chaplains – Bishop Patrick Walsh, Monsignor Ambrose Macauley, Fr Joe Gunn and Fr Gary Toman. And it features accounts from those staff involved in the life of the Church at present (while working within their own respective fields) such as Dr Gaven Kerr, Lady Brenda McLaughlin and current Vice-Chancellor, Professor Patrick Johnston. There is also input from artists such as Andrea Begley (winner of The Voice, 2013) and singing trio, The Priests. 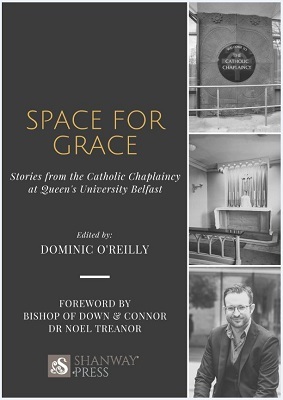 Space for Grace: Stories from the Catholic Chaplaincy will be launched on Tuesday 04 October in the Catholic Chaplaincy at Queen’s (28 Elmwood Avenue, Belfast 7) at 7:30pm. The evening includes music by The Goretti Girls – Méabh Carlin and Hannah McCauley – a photographic exhibition by local artist Daniel McCabe and a keynote address from Fr John Harris OP. For more information visit Facebook.